Cargo Floor B.V. is the leading European supplier of horizontal loading and unloading systems which are exported all over the world. With more than 20 years experience, excellent quality and an extremely high level of service, Cargo Floor B.V. is now recognised in the entire industry as world-renowned market leader! With sophisticated design and solid construction, low tare weight, allowing the maximum payloads and cargo volumes, and completely hydraulically operated, Cargo Floor’s ‘moving floor’ system is ideally suited to the unloading of a wide variety of bulk products, such as wood chip, sawdust, mulch and fertiliser, as well as food products such as potatoes, carrots and corn. Compressed bales, bulk bags and palletised freight are also possible with Cargo Floor systems. Cargo Floor systems are also suitable for stationary applications in transfer stations and transport/automated dosing systems in factories. 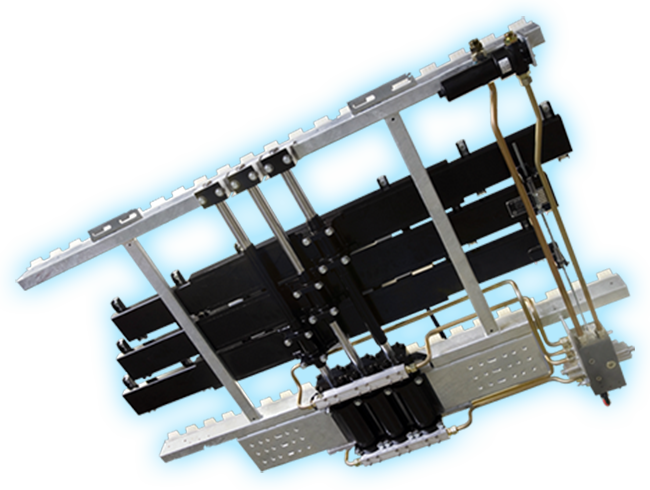 The CargoMatic system can be used for the fully automatic loading/unloading of pallets, crates and wrapped materials for dock-to-trailer, suited to short-distance shuttle transport. The CargoMatic system makes it possible to load or unload a 13,600mm trailer within 90 seconds.